Construction can be a physically and mentally challenging career, as well as a personally and financially rewarding one. Some people work construction for a brief time, perhaps to raise money for college, while others spend their entire working lives building (or demolishing) things. Entry-level construction jobs typically have no educational requirements, though high school-level training programs can be a big help. Some apprenticeship programs require a high school diploma or GED. To practice certain advanced skill sets, such as welding, you may need specialized training and appropriate licensure. Many construction jobs pay well. Prospective construction workers might not realize how many of the required skills they already have. 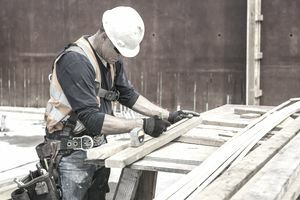 Many people learn construction skills by working on their own projects at home, or by doing volunteer work with neighbors or community organizations. There are also skills that are highly relevant to construction work, such as mathematics, that you may have learned in another context and don’t realize your prospective employer wants. While job requirements can vary a lot (be sure to read job descriptions carefully), use this list of commonly-sought-after skills to get a sense of how prepared you already are, and how far you might still need to go to get ready for your new career. You might also want to review our list of general work skills by job and type of skill. If you know how to do something relevant, say so. If you have specialized training or licensure (such as a CDL), say so in your application materials. Prospective employers cannot read your mind. Specific construction skills include bricklaying, carpentry, pouring cement, installing drywall, and the installation of specific types of equipment. The list goes on. Be sure to tell your prospective employer which of these tasks you have experience with and how much experience you have, even if it is not directly relevant to the job you are applying for. Employers typically appreciate versatile workers who can branch out into additional tasks as needed. As a construction worker, you will not only have to be strong and dexterous, you will also have to be smart about how you use your body. Proper ergonomics, including correct lifting posture and careful attention to safety, can prevent painful and costly accidents; career-ending injuries are not just for athletes. Bad habits can also result in repeated minor injuries that young, fit people may dismiss and ignore, but which add up to pain and disability years later. Plus, proper movement is more efficient and effective. Construction businesses, like all other businesses, require budgeting, planning, record-keeping, and marketing to stay afloat. If you have office skills, including familiarity with word-processing, spreadsheet, and publishing software, have excellent telephone etiquette, and good organizational skills and communications skills, you can be an important asset. Even if you spend most of your time on-site, being able to pull into the office as needed is important if the office becomes short-staffed, for whatever reason. Obviously, not all construction workers need management skills or leadership skills, but having them certainly gives you more options in your career. Managing worksites, developing estimates and negotiating prices, quality control, and reaching out to prospective clients are all important skill sets for construction workers with any ambition. Whether you are designing the project yourself or following someone else’s plan, you need to know how to read a blueprint. You also need to understand design well enough that you can spot problems or mistakes; while rare, blueprints can contain errors. You might also need to make decisions about what materials to use or how to schedule different phases of the project, and a good understanding of the project’s design will be critical. As a construction worker, you will be subject to building codes, environmental regulations, safety codes, and labor agreements. While entry-level workers will not be responsible for enforcing those regulations, training will go more smoothly if you know the rules already. Inspectors will appreciate if you know the kinds of information they’ll need for site visits. There is also the possibility that your employer—or your site supervisor, with or without your employer’s knowledge—could break the rules. Your own safety, and that of your client and those who live and work near your site, might depend on your recognizing and responding to the problem. Review your past experience and search for skills you have developed in managing and supervising. You may have developed these skills in volunteer or unpaid jobs as well as in past employment. You may not have had the job title, but were you delegated tasks that built this experience? Have you been involved in estimating or in bidding? Be sure to include these skills. The employer may be looking for experience and skills in specific phases of construction. Specify in which phases you have experience. Employers look for skills in understanding and applying codes and regulations, and if you list them, you may get better consideration for positions at all levels. Whether you are the designer or you are working with designs, be sure to include these skills. These skills include acting as an inspector and being familiar with inspections and what inspectors expect. These keywords can show you have skills that are useful for many jobs in the construction industry. Review your work history and include any skills or experience in specific jobs and professions. Even if you are applying for a different position, familiarity and skill with other positions can be a bonus for the employer. What tools have you used and what equipment can you operate and maintain? Do you have experience and skills that are useful on the business side of construction?